The Timber Trade Federation (TTF) is at the very centre of the UK timber industry. All members of the TTF must adhere to a strict code of conduct put in place by the organisation to regulate the UK timber industry. This code of conduct ensures all members deliver a high standard of product and service to UK customers. 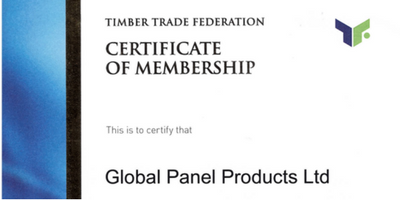 As members of the Timber Trade Federation we aim to meet the high environmental standards, due diligence and compliance laid out in the terms of the TTF code of practice. Global Panel Products are also implementing the Responsible Purchasing Policy (RPP). We have put in place a risk assessment process working towards ensuring all our purchases meet and encourage sustainable forest management.